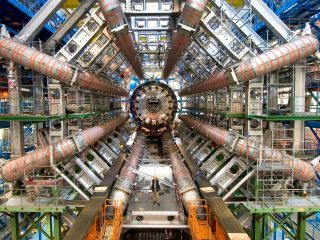 The much-delayed launch of the Large Hadron Collider has been hit with problems again after a bird dropped a baguette into the system causing it to overheat. The official reason the LHC malfunctioned during tests earlier this week was that it was caused by "a bit of baguette on the busbars" – apparently dropped by a hungry bird. The latest in a long line of malfunctions, including a faulty circuit, has already delayed the re-launch of LHC for the best part of the year – with even scientists thinking that there's something going on in the future that's stopping the particle accelerator from doing its day job. As this incident happened in testing, when none of the machine's magnets were turned on, it's not going to cause any lasting damage. In fact, if this happened when the LHC was operational then the machine would have automatically shut down for a couple of days – a fail safe which stops any lasting damage from upsetting the LHC for long periods of time. This may be the case but TechRadar has seen Spider-Man 3 and know just what happens when objects get mixed up in particle acceleration. It's just a hunch but expect a mutant bread bird to start attacking the planet in the very near future.